The first 6 to 9 months our calves enjoy their mother’s milk in combination with pasture and locally grown hay from Kyne Farms. 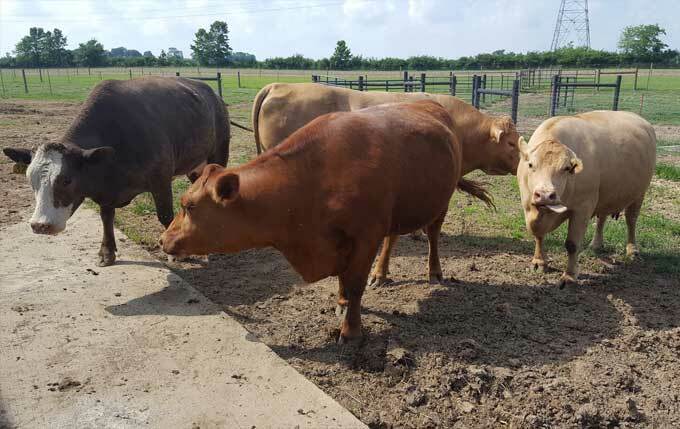 All beefalo are always provided free choice Purina® Accuration® Hi-Fat Block and Purina’s Wind and Rain® Storm® Fly Control mineral with Altosid as a mineral supplement. “O” SK Blend mineral contains natural Redmond Natural Trace Mineral rock salt and certified-organic Icelandic Thorvin kelp as a source of over 60 trace minerals and vitamins. “O” Selenium & Vitamin Premix mineral is formulated to supplement the nutritional needs containing selenium derived from selenium yeast and provide supplemental vitamins, including vitamins A, D3, E, and B complex. “O” Grazing Special mineral is especially designed for grazing cattle to provide magnesium, calcium, and phosphorus. It’s a fact, U.S. Department of Agriculture tests done as recently as May of 2016 prove that beefalo has less cholesterol than chicken and less fat, cholesterol and calories than traditional beef. Beefalo even meets the dietary recommendations of the American Heart Association so consumers enjoy all the taste of beef with added health benefits.